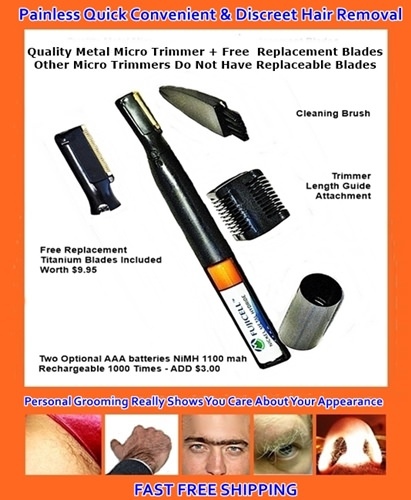 WHY BUY A TRIMMER WITH BLADES THAT YOU CANNOT REPLACE? Micro trimmers seen on TV & in stores all have cheap motors & poor quality blades - that cannot be replaced when worn or dull. 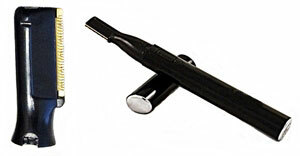 This black aluminum encased Micro Trimmer, designed to last, comes with a long life motor, Titanium infused blades, cleaning brush and a velvet carrying pouch. You also get a FREE trimmer guide attachment which allows you to trim close or leave hair a little longer. You can even pop off the trimmer head so that you can clean and oil the blades and keep them in optimum condition which is very important for long trimmer life. You can't do this with cheap plastic lookalikes. * Gentle enough for intimate hair removal - south of the border. * Gentle on the most tender sensitive skin "down there" like labia and testicles. The best part is the free set of replacement blades. I am looking forward to using this micro trimmer for a long time to come. Nice discreet size too. Very satisfied with prompt delivery & accurate info on item as described. Of all the micro-trimmers I've tried this one is far and away the best and most durable of the lot. The 2 year warranty is legit and the seller stands behind their product without hesitation. Q: How do I change the blades on a micro touch trimmer? A: They send you diagrams to show how to change the blades. 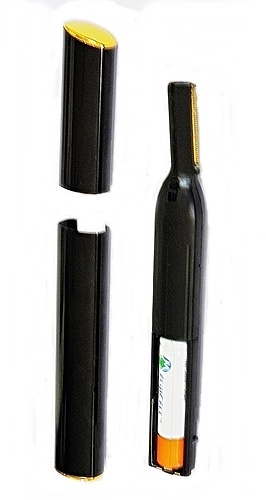 The blade assembly is locked and unlocked using the slide on the neck of the trimmer. It is great to be able to get replacement blades instead of buying a new trimmer.